22mm x 30mm 18K pink gold case and bracelet fully set with brilliant-cut diamonds, 6mm thick, crown set with a diamond, sapphire crystal, silvered dial with blued-steel sword-shaped hands, quartz movement. Water resistant to 30 meters. 22mm x 30mm 18K pink gold case, 6mm thick, octagonal crown with a blue sapphire, sapphire crystal, silvered dial with Roman numerals and blued-steel sword-shaped hands, quartz movement, 18K pink gold bracelet, folding buckle. Water resistant to 30 meters. 22mm x 30mm 18K pink gold case with black lacquer, 6mm thick, 18K pink gold crown with a blue sapphire, sapphire crystal, black and gold dial with blued-steel sword-shaped hands, quartz movement, 18K pink gold bracelet with black lacquer. Water resistant to 30 meters. 22mm x 30mm 18K pink gold case with brilliant cut diamonds, 6mm thick, diamond crown, sapphire crystal, silvered dial with blued-steel sword-shaped hands, quartz movement, 18K pink gold bracelet. Water resistant to 30 meters. 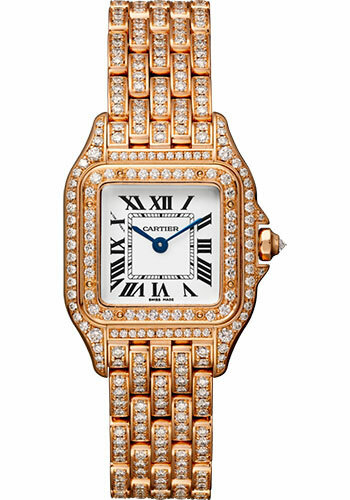 22mm x 30mm 18K pink gold case, 6mm thick, crown set with a diamond, bezel set with brilliant-cut diamonds, sapphire crystal, silvered dial with blued-steel sword-shaped hands, quartz movement, 18K pink gold double loop bracelet. Water resistant to 30 meteres.